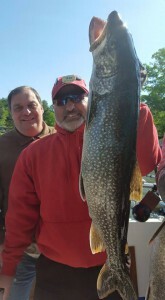 Lakers are in full swing- and Lake George fishing is attracting visitors from up and down the East coast. 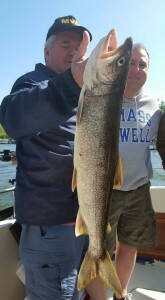 We recently fished with the men from Merrimack Adventures Club – they earned their reputation as great sportsmen reeling in some beautiful lake trout on a day that started with choppy waters and lots of rocking and rolling. In the end, good weather and great sports prevailed. 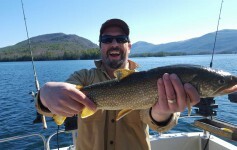 Enjoy the photos and make your plans to enjoy the Adirondacks’ finest fishing soon on Lake George. 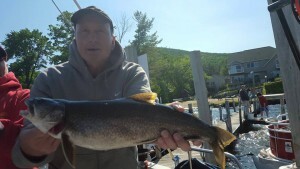 Previous Article Lake George Fishing Report 2015- They’re biting ! 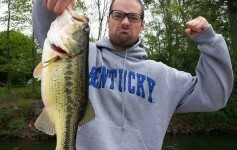 Next Article Lake George Fishing 2016! 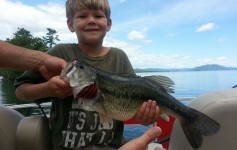 Lake George Bass Fishing 2014 heating up!